Register Log In ECN Forum Forums Photos for General Discussion The Original "Firewire"? I dunno - looks like there might be room for one more wire under there if you try really hard! Heck, ya got 60 amps to use up! If those wires are 20Amp, you're at capacity, but, if they're 15amp circuits, there's room for one more! Silly humans. Those are _9_ amp breakers. No overload problems at all. What difference does it make anyway? After all that is an FPE No-Trip breaker!! Why, so they blooming are! One even has the word NO engraved on it! The best part is this is a rental house and the property owner didnt see this as something that needed attention... He was whining more about having no room to shove a 240V dryer circuit in this mess.. When did they allow the breakers to be on in the down position? 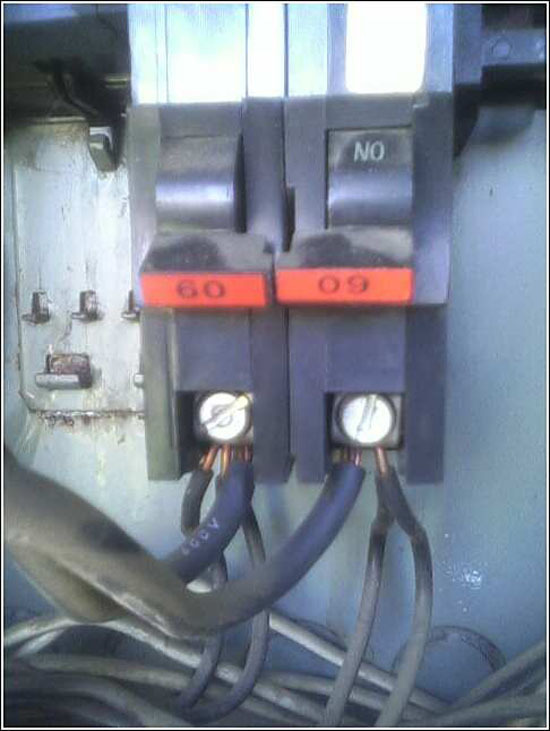 The rule against "upside down" breaker must be fairly recent...I've seen a number of Square D "combination" services where half of the breakers were upside-down.